While we enjoy our winter birds like the stunning red cardinals and the cheerful juncoes, if you’re a bird lover you are probably looking forward to the return of feathered spring and summer birds to your landscape. Hummingbirds rank at the very top of the most desirable bird for people to attract to their gardens. You can put out red plastic feeders, but there is something satisfying about watching those winged jewels flitting around flowers. If you want to attract more hummingbirds to your garden this coming spring, now is the time to plan some additions they favor. The hummingbird is a small, quick-moving bird. Having the right viewing tools and the best flowers can make the sighting of a hummingbird a success. People sometimes experience a lot of frustration because hummingbirds flit away so quickly it’s hard to get a chance to see them. A birding binocular can be an asset. Buying one that has high magnification can make it easier to get a good view of them. A wide lens allows a lot of light to enter the binoculars that makes seeing their colors and iridescent markings clearer. You can also use a short range viewing scope that can be set up on a tripod. These are also portable so you can go birding where ever you want. Attracting hummingbirds with plants that have rich bright flowers is essential in bringing these birds to your yard, and keeping their interest long enough for you to watch them. It is known that they prefer red flowers, and that’s true. Any color in the red range – fuscia, brilliant pink, orange, falls in this category. But there is actually a list of the top flowers to plant to attract hummingbirds. Start by planting native species with especially long or tapered shapes. 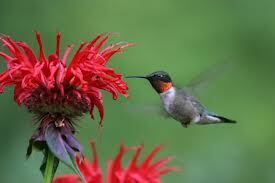 These work best because the hummingbird has a long bill that they use to gather the nectar in these types of flowers. These colorful flowers are great for attracting hummingbirds: Bee Balm (monarda) with its spherical shape and full spikes is a favorite. It’s good in zones 4-9. Lobelia (which is also known as the cardinal flower) can grow up to four feet, has red flowers and is good in zones 2-9. The time-honored zinnia is an easy to grow annual that blooms over and over again. It works great with flowers that are white, yellow orange, red and pink. Bleeding hearts, good in zones 2-9, have hanging heart bloom that grow best in light shade. They are tall growing to 36 inches so they offer the birder good viewing. Another good annual that works great in borders, pots, basket, and containers is the petunia. They absolutely thrive in full sun. Their habit of continually blooming makes them ideal for setting up a great viewing area full of planters or containers on a patio, in a border, or anywhere. If you choose petunias as hummingbird magnets, use those in the red or vivid pink color range. If you have questions about adding plants to your landscape to attract birds and other wildlife, our experienced landscape designers can help you find just the right selection for your garden as well as your intended visitors.